APTWREIS AP Gurukulam Entrance Test for 8th Class admissions in AP Tribal Welfare SOEs, COEs, AP Gurkulam SOEs 8th Class Entrance test 2019/ APTWREIS/AP gurukulam 8th class entrance test 2019, aptwreis cet 2019, AP Tribal welfare admission test, ap gurukulam cet, ap girijana gurukula vidyalays 8th class admissions, application form, last date, entrance exam date details given here. 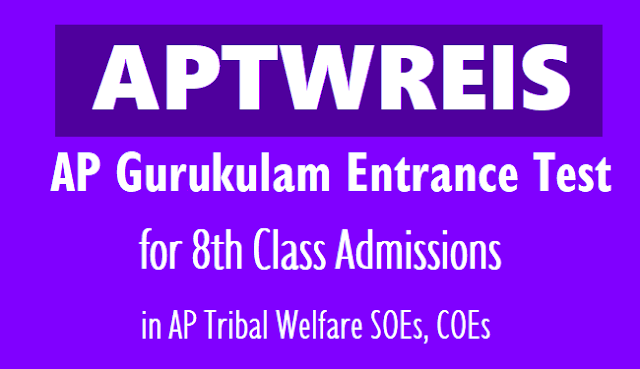 AP Tribal Welfare Residential Educational Institutions Society(APTWREIS) has issued common entrance test notification in April, 2019 for admission into 8th class in its AP Tribal Welfare Residential Schools of Excellence(SOEs) i.e., Paarvathipuram, Srishailam, Vishakapatnam, Srikalahasthi for the academic year 2019-2020. The APTWREIS invites applications from the eligible students for admission into VIII Class in its ap gurukulam vidyalays. APTWREIS popularly known as Gurukulam, to take care of enrolment and retention of tribal children and improvement in the quality of education imparted to them. Gurukulam transforms minds while arming students with the skills and knowledge to take leadership positions in society.The Right of Children to Free and Compulsory Education Act 2009 provides for free and compulsory education for all children of the age 6 to 14 years. In compliance with the constitutional provisions, APTWREIS (Gurukulam) vows to mould the tribal children for attaining an all-round development to become the real assets of the nation. Gurukulam is committed to promoting and imparting quality and excellence in education that supports interdisciplinary inquiry, intellectual development, knowledge and skill acquisition, and student success through a diverse, fully-engaged, learner-centered campus environment. Presently (137) educational institutions are functioning under the control of Gurukulam. Out of which (82) are residential institutions funded by Government of AP. In addition to this (12) Mini Gurukulams meant for low literacy areas funded by Govt. of India and (43) KGBVs meant for drop out girl children sponsored by SSA (RVM) are also functioning under Gurukulam. 1. All the ST students (Boys & Girls) who is appearing for 7th class March - 2019 in TW Residential Schools, Ashram Schools, Govt. Schools and other Govt. Recognized schools are eligible to write the 8th Class Entrance to admit in SOEs. 2. The Student must be a bonafide student of Class VII in a recognised school During the academic ear 2016-2019. 5. Selected candidates have to produce necessary certificates like, Caste, Income, Ration card SSID No, the Aadhar card. Marks Memo, Study, T.C; Physical fitness certificates, 06 Passport size photos ,etc., at the time of admission. 6. The Students should have passed 7th class, the students who have attend 7th class exams in 2019 are also eligible. Parental Income for the year 2017-2019 should not exceed Rupees One Lakh per annum. The entrance test will be for 100 marks contain 100 questions from 1. General English 25 marks, 2. Mathematics 25 marks, 3. General Science 25 marks, 4. Social Studies 25 marks from 7th Standard syllabus (In each subject multiple choice questions 5, filling the blanks questions 10 and Short answer type questions 10). Selections of the process through Entrance Test i.e APTWREIS 8th Class Admission Test 2019.
b) Admission will be given as per merit obtained in GURUKULAM CET-2019 and the preference of institution given by the student in online application. Submission of Application Form: Candidates may submit their applications through online mode. Online applying link is provided here. 1. All the eligible ST students only shall apply online. 2. Hall tickets will be generated online immediately after submission of the form online.Hall ticket generated should be printed by the candidate. 3. No postal correspondence will be entertained.